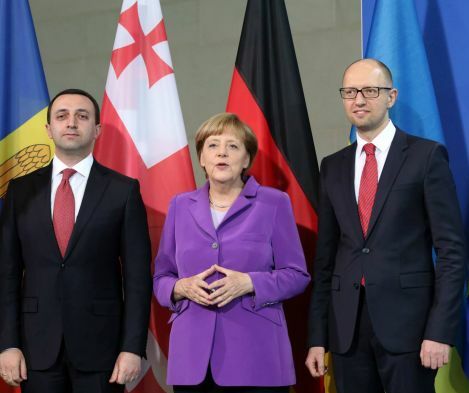 TBILISI, DFWatch–The prime ministers of Georgia, Moldova and Ukraine on Wednesday met with Chancellor of Germany Angela Merkel in Germany. “We would like people to know that which road to choose, and our meeting today is held exactly for this [purpose],” Angela Merkel explained after the meeting. Georgia will sign an association agreement with the European Union on June 27. Georgia and Moldova have gone through the first signing procedure called initialing, while Ukraine is preparing to sign. “We are ready to successfully implement our European Integration priorities in order to build the common future in European family jointly,” Georgian Prime Minister Irakli Garibashvili said, and described the association agreement as an action plan for Georgia’s Europeanization.